Any semi-rational being knows there’s rarely, if ever, such thing as a “sure bet.” This is especially true in a city like Las Vegas that profits from the blind optimism (i.e. delusions) of individuals who believe there IS such thing as a guarantee when it comes to gambling. At Aburiya Raku, an izakaya-esque Japanese restaurant located in a mini-mall off the strip in Chinatown, a stand out meal is the closest thing there is to a guarantee in Sin City. I’ve yet to visit Las Vegas without a meal there (they’re open until 3am on Friday and Saturday making it an ideal post-club stop for those looking to escape the trappings of hotel delis and other less-worthy late-night spots), and it’s gotten to the point that my plans for the weekend revolve around when I can secure a dinner reservation. On this most recent trip, the earliest opening was Friday night at nine o’clock despite calling two weeks in advance. The regular menu at Raku has plenty of great items to choose from, be it their cold/hot appetizers, robata grilled skewers, or rice, noodle, and soup dishes. The homemade tofu is can’t-miss, as is the Kurobuta pork cheek, but where Raku truly shines is their daily specials written on a chalkboard and brought to each table shortly after being seated. 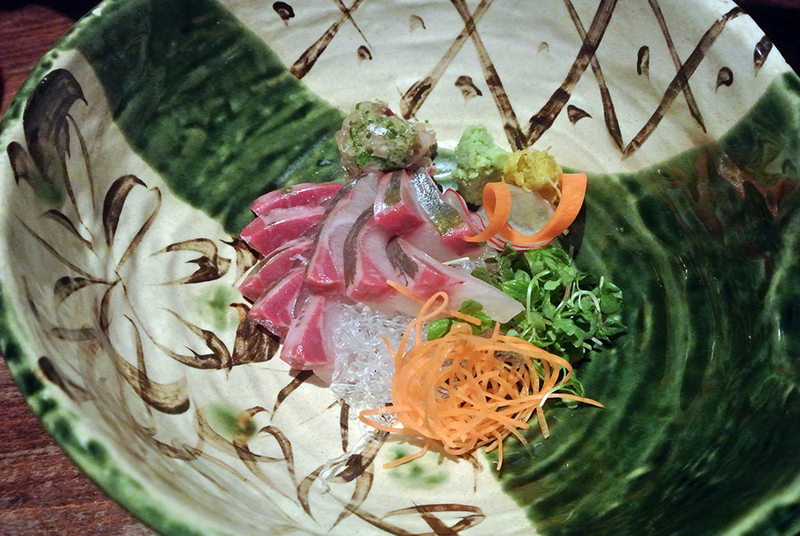 Expect to find several options of fresh fish, usually served as sashimi or fried, in addition to other cooked bites always worthy of ordering. There’s also plenty of beers and sake to choose from, though I usually keep it simple with a pitcher or two of Asahi. 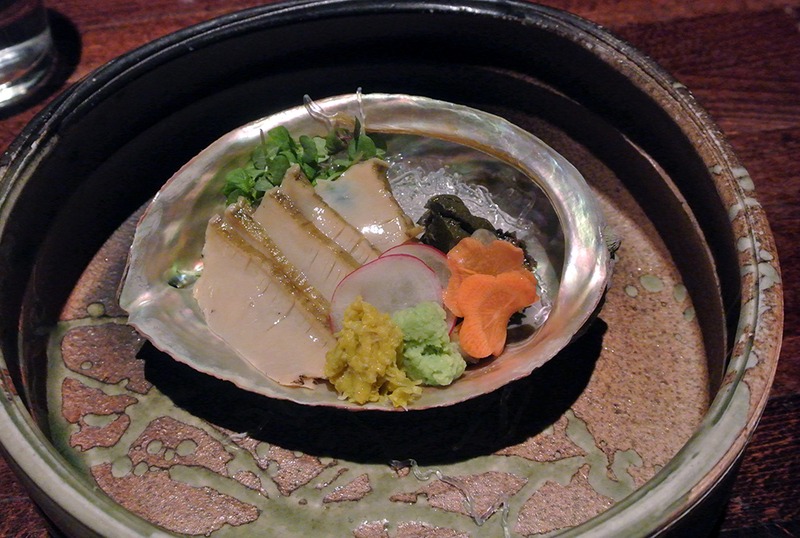 Abalone isn’t something that I encounter all that often so I had to order it as soon as I saw it on the specials board. 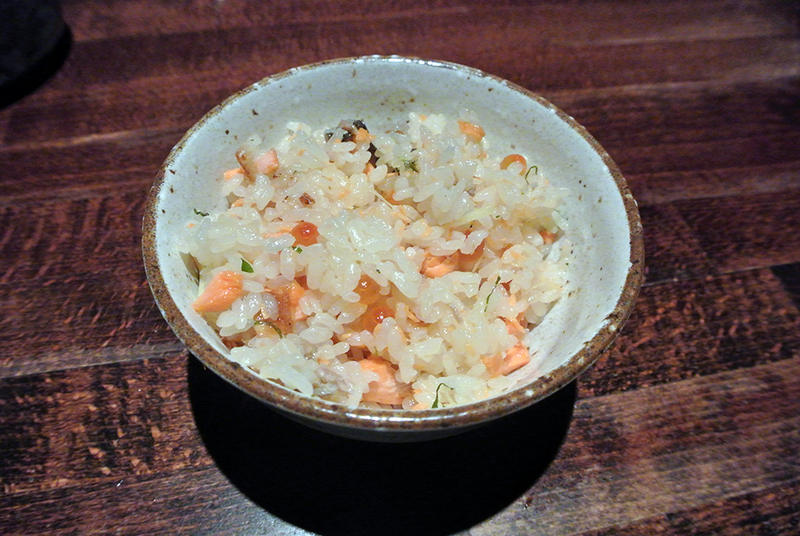 Thin slices showed off the awabi’s firm, crunchy texture, while its strong ocean taste was eased by the accompanying pickled chrysanthemum, wasabi, and slices of carrot and radish. The gritty liver was also served, lending an added texture that paired well with the clear seaweed noodles. Raku is known for its superb house-made tofu, and the agedashi version here proved to be just as good as on previous visits. The subtle flavor of the fried tofu really allowed the dashi-based broth to come to the forefront, while the tofu’s softness paired well with the crunch of shredded nori and slivers of scallion. I challenge any tofu hater to try this and not end up finishing the entire serving. After realizing that I had missed this dish on previous visits I made sure to get it this time. The deep-fried bird arrived in sliced rounds with a layer of taut, crispy skin wrapped around the de-boned and then rolled meat creating a circular pattern similar in appearance to that of porchetta. The result was a perfectly cooked, juicy chicken that is up there with the best fried chicken in ANY category. Even the spinach, treated with a proper dressing instead of being relegated to mere garnish, was great. Another special this evening was a sashimi of striped jack, beautifully presented to show off the fishes silver skin and pink-tipped flesh. The shima aji was firm and a touch chewy but absolutely pristine in terms of taste. 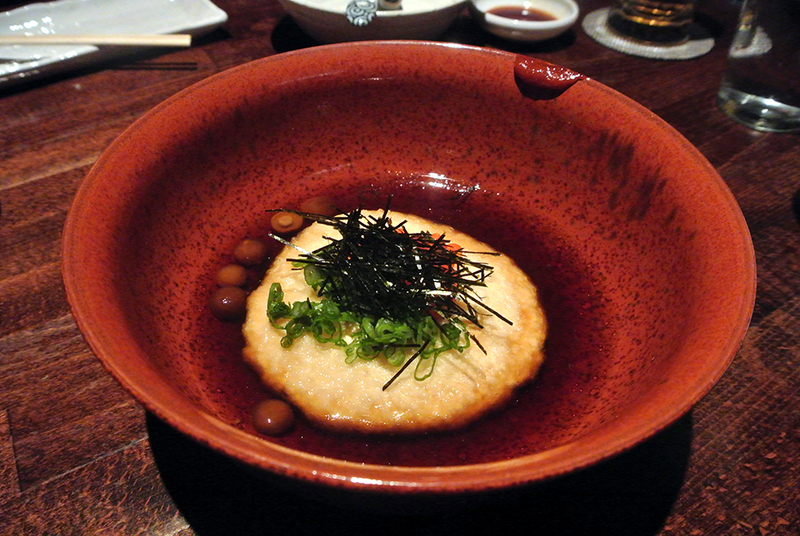 Even better was the tiny sphere of belly meat chopped and mixed with thinly sliced negi. 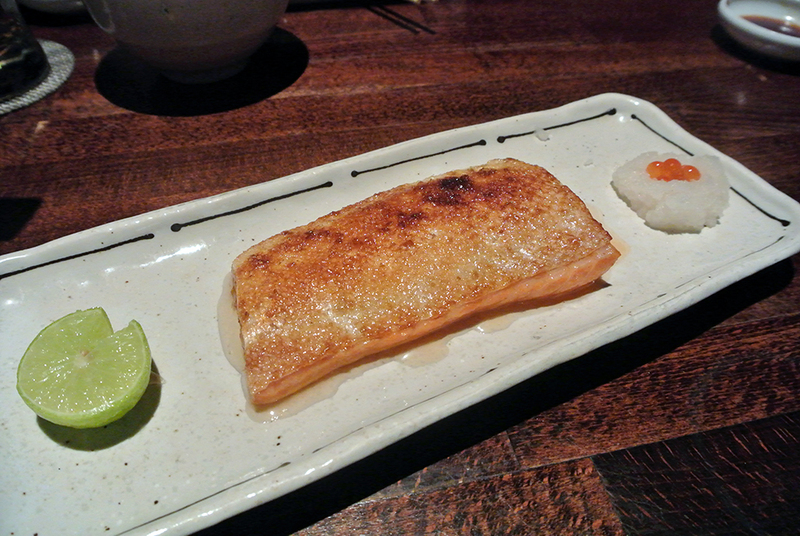 Returning to the regular menu, a section of salmon belly was up next, served alongside a lime wedge and ikura-topped grated daikon radish. Cracking through the thin layer of deliciously oily and crisp skin revealed the soft, moist belly. Salmon has become such an ubiquitous fish in recent years, but I was reminded here of why it became so popular in the first place. 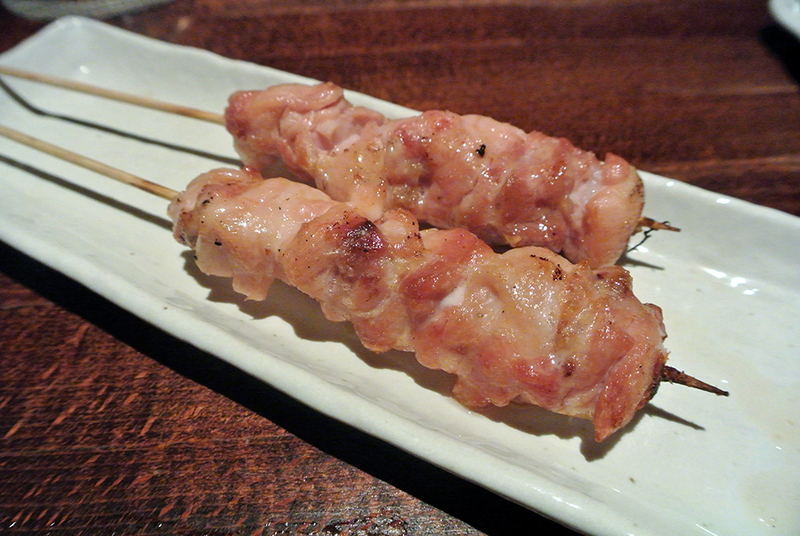 Moving on to some yakitori, first up was momo, or chicken thigh, a straightforward bit of bird that was simple and juicy. Chicken breast was up next, wrapped in its own skin for good measure to ensure that the white meat doesn’t dry out. I got a lot more char flavor on these than with the thigh meat before. Time and again this pork cheek makes me close my eyes and smile. It’s a perfect example of “less is more,” leaving the glorious fatty pork flavors pure and prominent. 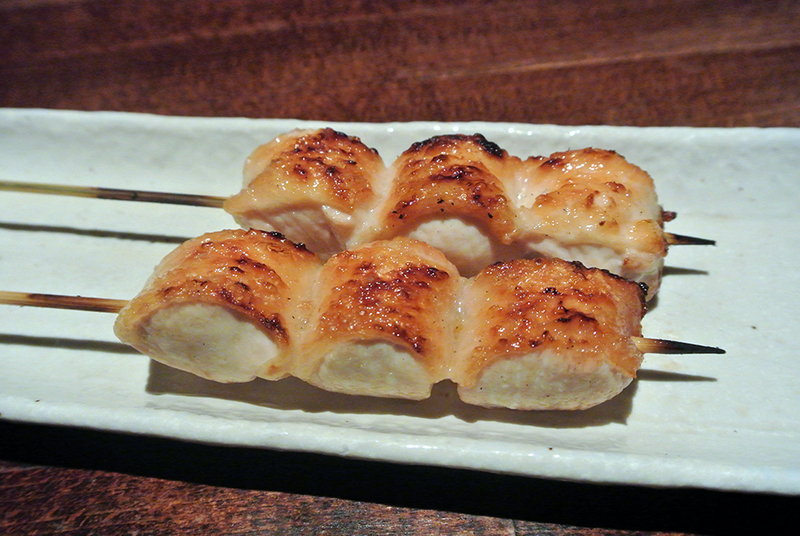 These things are rapidly approaching “last meal” status, and I decided that I could easily eat five or six of these skewers with a side of rice and nothing else, and be perfectly happy. 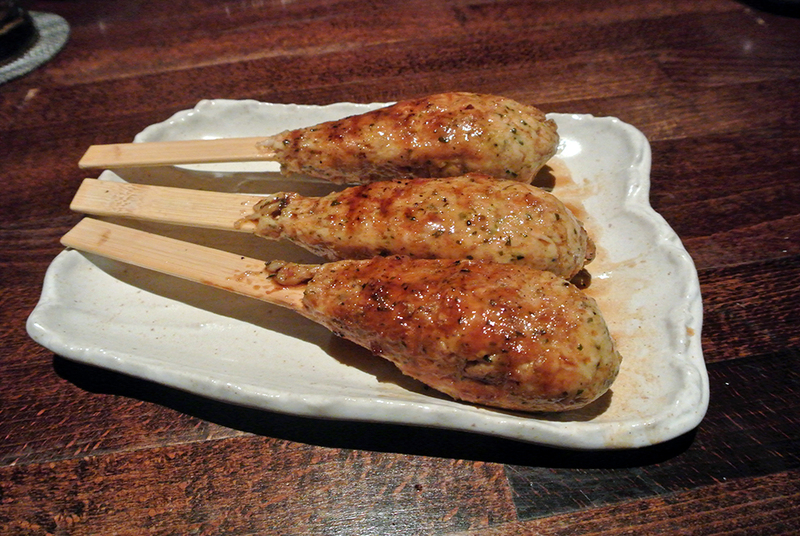 I’m a big fan of the two very different versions of chicken meatballs served at South Bay yakitori kings Shin Sen-Gumi and Torihei, so I was eager to see how Raku compared. The ground chicken here was formed into a loose patty instead of the more familiar round meatballs, and didn’t have the same crust that I was looking for. 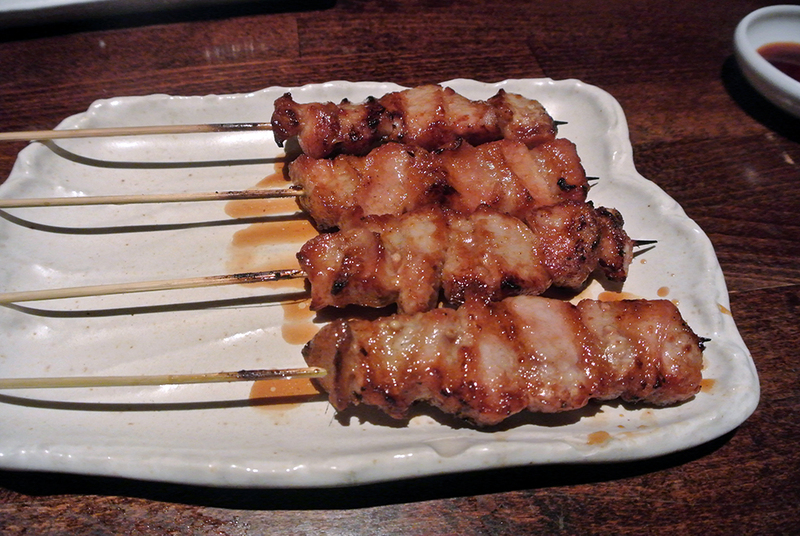 Still, the meat was succulent and well-seasoned, and fun to eat off of the stick. 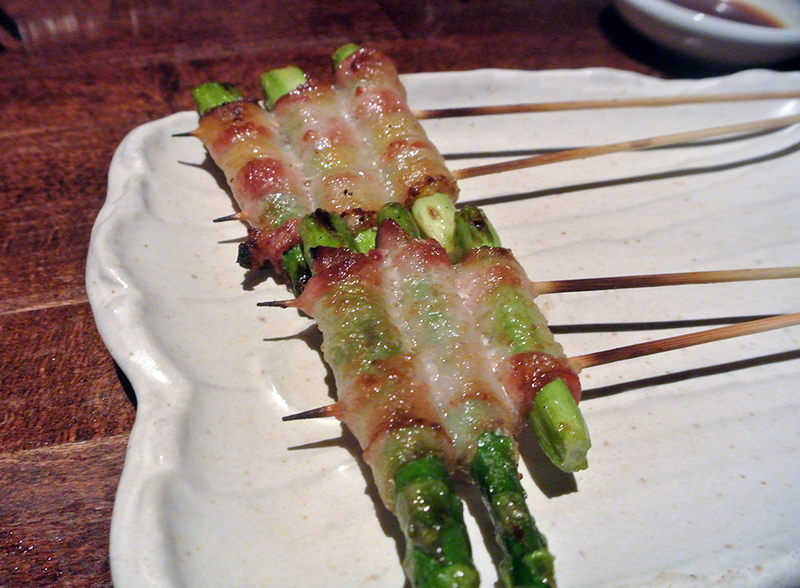 Bacon wrapped asparagus was a no-brainer, the green stalks grilled until just-blistered, slightly bitter but perfect with the oiliness of the pork. 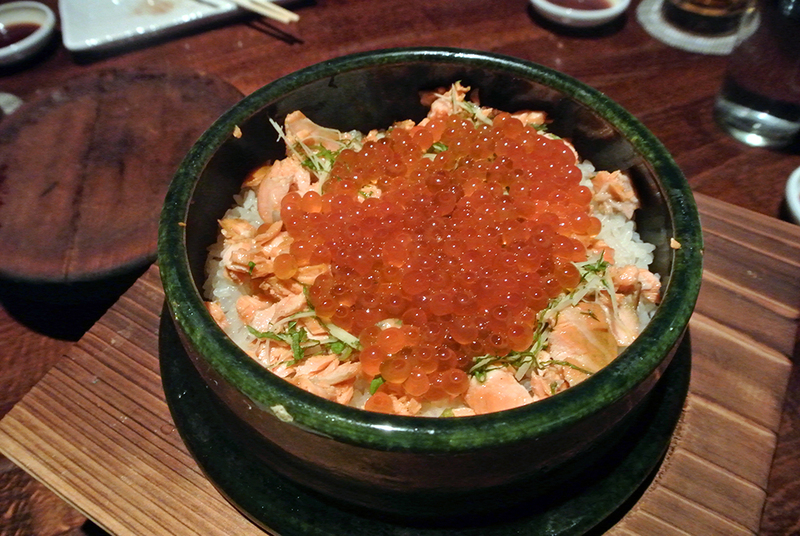 The evening’s final dish was an off-menu item called kamameshi (“kettle rice”) that featured warm sushi rice topped with flavorful flakes of salmon, shredded shiso, and of course, a serious heap of ready-to-burst salmon roe. After a good mix to incorporate the ingredients, the rice was then scooped into individual bowls and quickly devoured. It was comforting in its simplicity, yet addictive in taste, as our table seriously considered a second order. 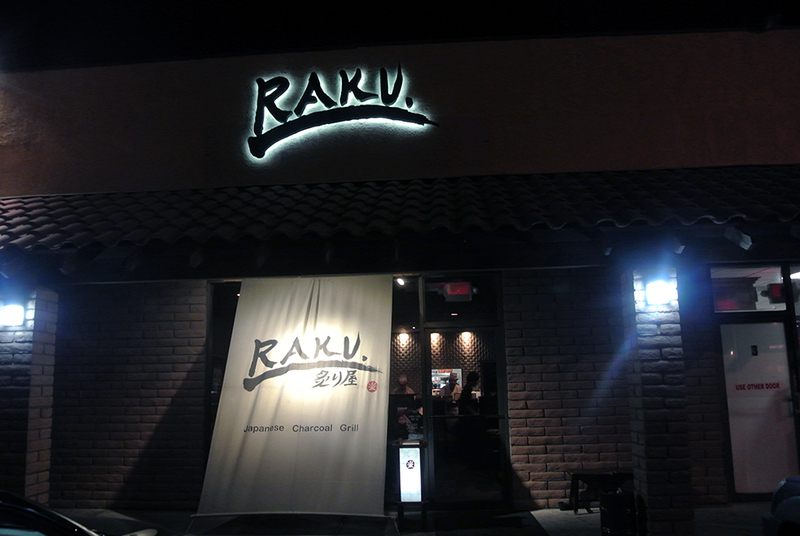 With yet another delightful dinner in the books, Raku remains my favorite restaurant in Vegas. Admittedly, I haven’t yet ventured into the high-end dining scene in the city, but frankly I refuse to sacrifice a meal here. Service can be a bit slow since the restaurant is constantly busy, but in a city that moves as fast as Vegas does, the slowed pace ends up being a welcome relief, a chance to relax and perhaps conjure up that next “sure thing” bet.